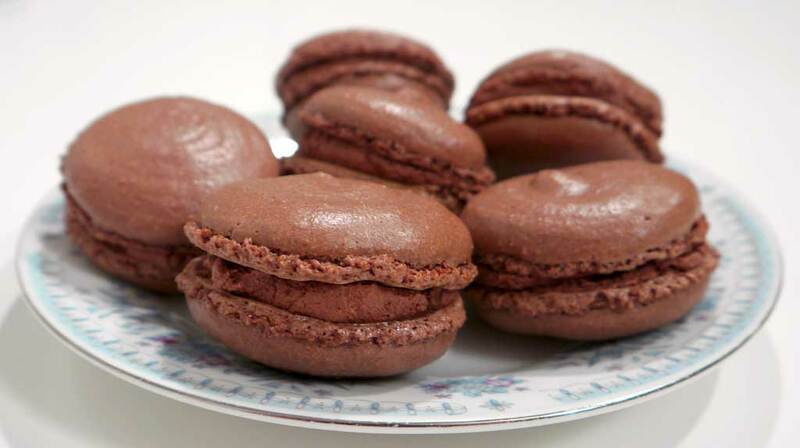 There are few cakes that look as inviting as Macarons. Baby chocolate "burgers" with cream in the middle. In various colors even. They are not as difficult to bake as they might seem, and they are a great addition on any coffee table. Or as an accompaniment to a dessert. Ice, panna cotta etc. My personal favorite is this version with chocolate. The ganache has to be cold before it can be whipped to a froth. Therefore it must be made first. Chop the chocolate into fine pieces. Put the chocolate, butter and cream into a bowl. Preferably a metal one. Melt the mixture in the bowl in a hot water bath. Just use water from the hot tap, that is usually just right in temperature. Whip it into a uniform cream. Refrigerate until completely cold and firm. Preferably overnight. At least for a few hours. Beat it to as light a foam as you prefer, just before you put it in between the buns. Beat the egg whites with the sugar. You should be able to turn the bowl upside down, without it falling out, but no more than that. The foam should not be completely rigid. "Soft Peaks" it is called. Mix all the dry ingredients and run them through a sieve. It is important to avoid lumps. Mix the wet and the dry ingredients with a spatula or a whisk. Mix them well. Put the dough into a freezing bag (or piping bag) and cut an approximately ½ -1 cm (1/4 - 1/2 inch) hole in it. When you make the buns, you should hold the freezing bag about ½ cm (1/4 inch) above the baking paper and press out the dough in flat circles. Do not move the bag in any direction. They should end up as about 4 cm (1½ inch) large circles just by being squeezed out of the freezer bag. When you keep the piping bag close to the baking paper while squeezing out the dough, the macaroons will automatically be flattened. This makes them nicer to look at. Turn on the oven at 160°C (320°F) convection. Let the buns rest for 20-30 minutes until they get a "skin" that does not stick to the fingers when you touch them lightly. Bake for about 15 minutes maybe a little less. Remove them from the baking paper by running a thin knife quickly under them while they are still warm. Allow the buns to cool. Then scrape off a good teaspoon of ganache on one bun, and put the second bun on top of that to make a sandwich. It's a good idea to pair the buns once they have cooled. That is, to put them two by two, in pairs of equal size. That way they will fit when you gather each macaroon. Then it doesn't matter that much when they are exactly the same size when you pipe them on to the baking pan. Almond flour is available in finished form in some health food and baking stores. But you can make your own too.